Nuclear medicine (also known as nuclear scintigraphy) is a noninvasive imaging procedure where radioactive isotopes (or tracers) are introduced to the body in order to evaluate the bones, kidneys, thyroid, or liver for disease. Once the isotopes have been administered to your pet, he or she will then placed on a specialized machine called a gamma camera that detects the amount of radiation being emitted. The gamma camera will create an image based on the location and amount of the radionuclide within the region of interest. 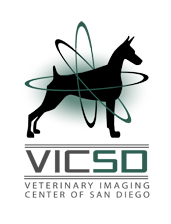 The radiation doses from a nuclear medicine study are low and your pet will not feel any untoward effects from the procedure. California state law requires a holding period following administration in order to allow for the radioactivity to decay, so your pet will have to remain at our hospital until the afternoon. This helps to ensure the safety of your home and family. Please contact us at (858) 634-5430 to discuss special instructions for preparing your pet for the scheduled procedure. Bone Scans – Best for pinpointing the location and extent of disease and/or source of pain.